Goerlich Quadruplets: A Memorable Weekend, For Sure! A Memorable Weekend, For Sure! We didn't take any road trips, or have a day at the lake. No jet setting for a weekend getaway. Still, we had a memorable weekend - one that was picture perfect. Here are just a few we captured on camera, there are hundreds more that we'll keep in our hearts. 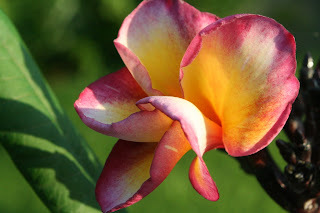 We smelled summer with the Plumeria blooming on our patio. 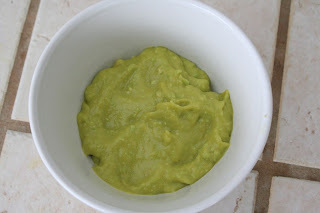 The babies tried new foods...this one is mango, lime, avocado! 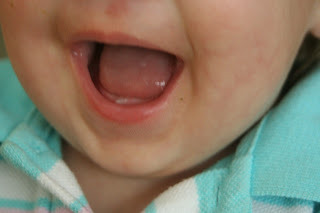 Sophia worked on growing her teeth that she'll need for summer sweet corn! We took over the park! 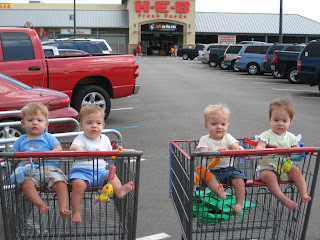 Went grocery shopping - check out those carts! And dreamt of doing it all over again! This post is UNBEATABLE! Absolutely fabulous! The pictures are amazing! You captured such awesome memories so well. I'm so glad you're enjoying all these awesome adventures. I just posted some park pictures too! 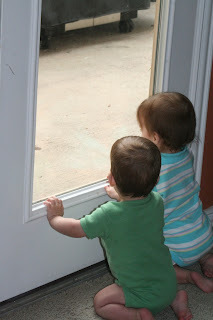 =) The boys truly love the great outdoors - thank goodness since we do too! Jaz is such a sweet dog. 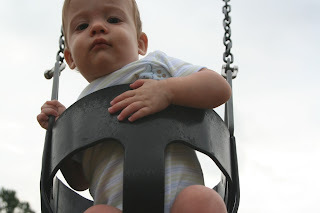 My fav pic is of course the one of the legs hanging in the swings. Barefeet little Sweeties. Great video footage too! Okay, I'm going to bed now and I'll quit taking up screen space on your precious comment section. Night Night! Amazing photos! I love the color and angles of them (especially the swings). What precious memories. Those babes are growing fast! 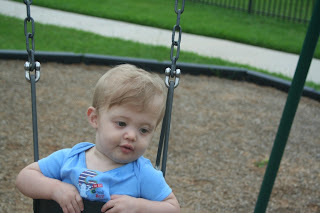 I LOVE the chunky, little legs dangling from the swings! That is SO precious! I can't stand it! 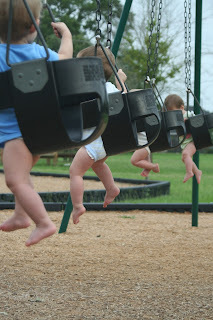 Love that picture of all four (sets of) swinging baby legs! Two awesome! Another mix, that sounds odd, banana-avocado, sounds gross but I haven't met a baby that doesn't like it! Love the new pictures! Looks like you are having the time of your lives. What cuties! Oh,what a wonderful weekend! I am amazed at all you did - the pictures are adorable. Hugs to each one. Much love. Precious babies, sounds like a wonderful, memorable weekend! A friend in East Texas, Pam. 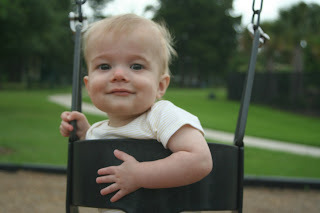 Love the picture of the babies in the swing! Amazing shot! your family is beautiful! The babies look so cute! I love the swing picture. I know we emailed a few times about meeting in houston or up here in Dallas. i'm hoping to be down there sometime in June, will ya'll be around? I'm hoping to meet us with the Wells also (another set of gggg quads). The pictures are wonderful! The babies are growing so fast. Isn't it great that sometimes the simplest things are the best. ok, sounding completely unoriginal after reading the other comments, THAT PIC OF THE FOUR QUADS ALL IN A ROW IN THE SWING IS AMAZING! holy cow! so freaking cute! and loved yalls post about roughin it under the houston sky--u guys are too fun. i love it. and the "dont drink the water" caption?...there is no other phrase that would suit that picture better! Love the song and the video!! 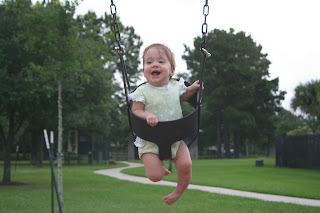 I too loved the feet dangling from the swing. You have inspired me to take my kids out more!! !